Where would a certain No. 1-rated network be without two consonants -- C and S -- plus a vowel -- I? CBS already has three still prosperous CSI series. Now it has a pair of NCIS hours, one right after the other. The incredibly resilient NCIS, stronger than ever as it enters its seventh season, has spawned a spinoff that also might well have long-term staying power. NCIS: Los Angeles, a little more now, a little more wow, launches Tuesday night after the original lays the groundwork. Its principal men of action, played by Chris O'Donnell and LL Cool J, are special agents of OSP (Office of Special Projects), which CBS publicity materials say is a division of NCIS (Naval Criminal Investigative Service in case you've forgotten). Whatever. In the annals of hit TV franchises, you make this stuff up as you go along. NCIS: Los Angeles, sneak-previewed last season within an NCIS episode, is also buoyed by diminutive Oscar-winner Linda Hunt (The Year of Living Dangerously) as Henrietta "Hetty" Lange. She keeps the boys and girls in line while also providing them with the very latest in high-tech equipment. Hunt hijacks every scene she's in, insisting on proper bookkeeping in return for all the new toys. She doesn't much like the civilian garb preferred by Special Agent G. Callen (O'Donnell), who's just returned to work after surviving a hail of bullets, some of which perforated him. "Just because you're an orphan doesn't mean you have to dress like Oliver Twist," she says as a witty means of dressing him down. G, you see, doesn't know who his parents are, or even what his particular consonant stands for. This is supposed to make him a more poignant character, and in fact it kinda does. The poor guy also notes that he's never gotten a birthday card. 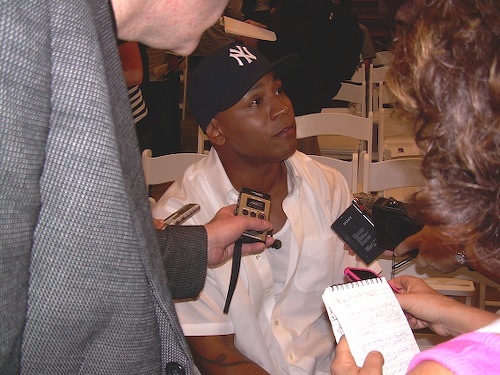 LL Cool J, his rapping days on the down low, plays Special Agent Sam Hanna, a former Navy SEAL who always has G's back -- and vice versa. They operate out of a new HQ outfitted with touch-screen technology, micro-surveillance cameras, a wardrobe department, etc. In Tuesday's premiere, the unsolved murder of a seemingly kidnapped Navy officer springs G and Sam into overdrive while a support team of Nate Getz (Peter Cambor), Dominic Vail (Adam Jamal Craig) and Kensi Blye (Daniela Ruah) pitches in on a moment's notice. Director Leon Vance (Rocky Carroll) bridges both NCIS series by issuing orders via satellite. A pair of short but effective action scenes -- gun battle/fistfight -- invigorate this first stand-alone outing. And the banter between G and Sam is OK for starters. Thankfully, though, a scene involving Hunt is invariably around the corner. Fists and bullets fly, but her presence arms NCIS: Los Angeles with a texture you can count on. So warm up that supporting actress Emmy. It already looks as though it's coming her way.